A swimming pace clock provides many benefits. When you are involved in competitive swimming, it’s important to make sure you use the right competitive swimming equipment to help you improve and do your best. Using a portable swim pace clock allows you to time your laps and determine whether you are making them faster than before or if you need to work harder. Understanding the benefits of using a swimming pace clock will show you the importance of investing in this piece of equipment to enhance your training. 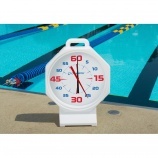 The purpose of using a portable swim pace clock is primarily to help you track your time as you swim across the water. All you need to do is look at the clock before you push off the wall or dive in and then glance back at it when you hit the other side of the pool. This will provide you with the amount of time it took you to cross the pool. If those times are improving, you know you are working hard and making the progress you’re looking for. However, if you find your times are staying the same or even getting longer, there are improvements that need to be made. In addition to letting you know whether you’ve been improving your swim times, a swimming pace clock can also help you keep your mental agility going strong. This is because when you use a swim clock, you will have to make quick mathematical calculations that tell you how much time it took you to cross the pool. This can help keep your brain and mental acuity sharp, along with improving your physical fitness. Having the right competitive swimming equipment is necessary to ensure you are improving and always swimming your best in the water. A portable swim pace clock can be one of the most powerful tools in helping you improve your times and track your progress. In addition to tracking how well you’ve been doing, this tool can also help you keep your mind sharp, providing a vast array of benefits that extend beyond the physical benefits of swimming itself. If you’re looking for the right equipment to improve your swimming, contact us. Competitive swimming equipment from D & J Sports in Dallas can provide the help you need to become the best swimmer you can be.